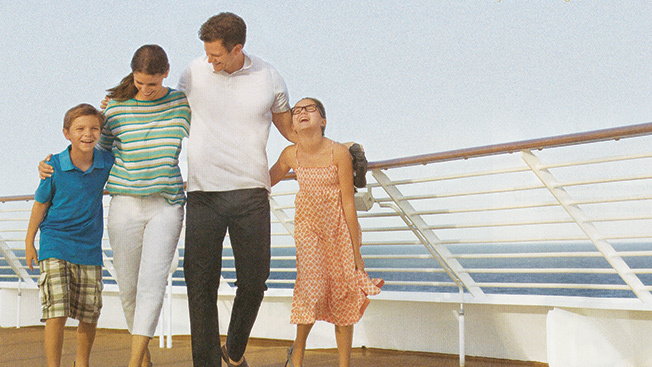 Yet as the ads here illustrate, if there’s one thing more startling than the growth of the $38 billion cruise industry, it’s the comparatively recent takeover of the seas by kids. Cruise lines carried 1.6 million passengers under 18 last year, and while it’s probably no surprise that the likes of Carnival boarded over 700,000 children on its ships in 2012, even grown-up carriers like Norwegian report that “intergenerational travel groups” now make up to one-fifth of their rosters. How did passenger ships go from floating adult playgrounds like the one in this 1951 ad to the literal playgrounds they are now? And so it went for many years—until everything changed. Fast. Disney World opened in Orlando in 1971, drawing millions of families to central Florida. One year later, retired cargo shipper Ted Arison bought a mothballed Canadian ship and started Carnival Cruise Lines, which trumpeted informal, budget-friendly cruising out of Miami. By 1983, Disney had taken notice. Inking a deal with Premier Cruises to drop costumed characters aboard ships leaving Port Canaveral, Disney launched the Big Red Boat, which Stone helped to market in its early days. Somewhere amid these new business ventures—and the falling away of old social formalities—“the idea of families started to come into the travel psyche,” Stone said. There’s no better proof of that than Disney Cruise Lines, which in 1993 nixed the Big Red Boat deal to set sail on its own. The House of Mouse was the first carrier to design ships with kids in mind, including extra large suites for families, “Youth Clubs” and teen-only spas. It’s essentially the junior equivalent of the adult distractions that Cunard hawked in this ad 63 years ago. And while today’s dad still has his arm around mom’s waist, it’s not to do “the stroll” but to take one instead—with the children.